Friday's auction earned Brazil a combined US$1.9 billion (R$6.15 billion) in signing bonuses and US$233 million (R$760 million) in planned investments. "Brazil returned to the oil and gas sector with this auction,” exclaimed ANP Director Decio Oddone. RIO DE JANEIRO, BRAZIL – Representatives from the oil industry’s heavyweights were in Rio de Janeiro on Friday, October 27th, as Brazil held its much-anticipated auction of eight blocks in the highly sought-after pre-salt region. 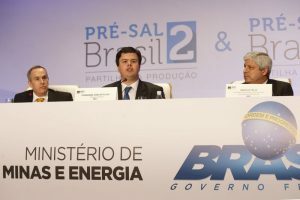 ANP director, Décio Oddone with Energy minister, Fernando Coelho Filho and Petroleum and Natural Gas secretary, Marcio Félix, at Friday’s pre-salt auction, photo by Tomaz Silva/Agência Brasil. In the end, six of the eight blocks were auctioned, which, according to the National Agency of Petroleum, National Gas and Biofuels (ANP), generated US$1.9 billion (R$6.15 billion) in signing bonuses and will lead to US$233 million (R$760 million) in investment from the winning companies. Brazil’s Petrobras and British–Dutch multinational, Shell, came out as the early winners, with the two oil giants involved in the winning bids for five of the eight blocks in separate consortiums along with Total, Qatar Petroleum, BP, and China’s CNOOC. The sixth pre-salt block was awarded to a consortium of Statoil, ExxonMobil and Galp. Friday’s auction occurred in two separate rounds, with four blocks available in each round. According to the ANP, the second round generated approximately US$1.05 billion (R$3.3 billion) in signature bonuses and US$93.4 million (R$304 million) in planned investments. The third round generated approximately US$876 million (R$2.85 billion) in signature bonuses and will bring in approximately US$140 million (R$ 456 million) in investments. Despite the auction ending with two blocks still on offer, ANP Director Décio Oddone considered the event a huge success for the country. The auction marked the first time international oil firms would be allowed to operate fields in the pre-salt reserves as part of reforms from beleaguered Brazil President Michel Temer. Previously, Petrobras had to participate in the bids for all blocks with a stake of at least thirty percent. As of Friday morning, some doubted as to whether the pre-salt auction would even occur. Late Thursday, October 26th, at the behest of PT (Workers Party), a federal judge in Amazonas issued an injunction suspending the event. But, the Brazil government appealed the injunction, which was overturned the morning of the auction.